Whatever your views are on the “Tourist go home!” messages graffiti-scrawled throughout the city, you can’t possibly oppose an effort to inspire a more elegant tourism in Barcelona. Unexpectedly setting themselves up with the task is Yök Casa + Cultura: a B&B just off Urquinaona whose newly eco-renovated spaces shine not only with a more responsible approach to urban living, but also with that cool factor people come to the city for. With white-molded ceilings, distinctive Modernista tiles, a Nordic design sensibility and balconies overlooking sun-dappled façades, Yök is the type of Instagram-perfect apartment you post that gets likes by the second. Hashtag stunning. But Yök does far more than just stun. At the heart of its existence is a desire to live in a better way, in a better space, all made with a better world and community in mind – the Barcelona community. Responsible for conceiving Yök are eco-designer Petz Scholtus and hotel management expert María José Rodríguez Marañís, who went on to transform turn-of-the-century apartments into sustainable spaces for the environmentally conscious. So how “eco” is Yök? Apart from reusing objects such as reclaimed sinks and second-hand furnishings, Yök prioritizes the use of locally produced materials and furniture that require less energy to transport. For the office and event space, the team opted to restore the original floor uncovered from a layer of cork and installed kitchen counters composed of recycled content. To manage energy consumption, windows were fitted with sensors to automatically switch heating and air conditioning off when opened. Contributing to sustainable energy management, Roca’s Cold Start faucets trigger hot water only when turned to the left. Traditionally, both hot and cold water are triggered as soon as a tap is on, consuming more energy than required. Yök’s blog catalogues not only the steps taken in the renovation but also the suppliers integral to equipping the space with the most ecological options possible. One such provider is Som Energia, a renewable energy cooperative that supplies power generated by wind turbines, solar panels and biogas plants. However the unavailability of rooftop space prevents Yök from generating its own solar power, at least for now. The journey from early 20th century Modernista apartment to today’s Yök sounds more effortless than one might expect. This ease is thanks to Petz’s previous work on the R3project. Documenting the eco-renovation of a Barri Gòtic apartment from 2006 to 2010, R3project adapted urban housing to a greener lifestyle. The project made waves, attracting local and international press not only for its ingenious approach to renovation challenges, but also for its timeliness. R3project was reducing, reusing and repurposing away at a time when Europe was plunged into an energy crisis. In a world saturated with eco-buzzwords, Yök comes with the transparency to back up its claims and reveals a personal dedication to its cause. 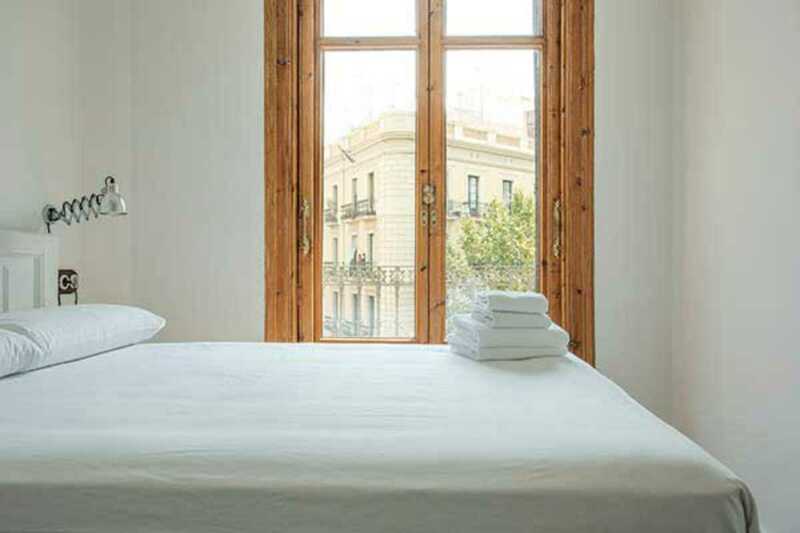 This inspires better tourism by attracting a socially-conscious traveler, eager to discover the “real” Barcelona, and doing so with respect for its environment: a traveler who shares Yök’s own philosophy. This traveler may sound like a rarity when thinking of the rowdy tourists littering the streets by day and loitering in them by night. “The barrio needs its rest” read banners strewn across buildings around El Born Centre Cultural. Red letters spray-painted on raw canvas beg for a better solution. But there are socially and environmentally conscious tourists out there. A survey by Trip-Advisor confirmed the “green” travel trend, with 71% saying they planned to make more eco-friendly choices within the next twelve months. A Condé Nast Traveler’s survey found that 93% of readers felt that companies should protect the environment and 58% pegged their hotel choice to the support the hotel provides the local community. Of course surveys are one thing and reality is another. But renovation is about realizing new possibilities for something that no longer serves its original purpose. Yök transformed a century-old apartment into a socially and environmentally responsible space for urban life today. It is an example for what big steps a small group of people can make. Transformation doesn’t happen overnight. And like Yök, Barcelona tourism could benefit from a renovation.